Minimum quantity for "POOR CHARLIES ALMANACK EXPANDED 3/ED (HB)" is 1. This book also includes the talks and speeches that he had given in a specific twenty-year period. It has a Ten Talks section that covers a wide range of his interests that ranges from how one attains worldly insight to how his Multiple Mental Models could be used for business. The tenth talk in this section is a unique version of "The Psychology of Human Misjudgment" that the author wrote just for this book. Poor Charlie's Almanack: The Wit And Wisdom Of Charles T. Munger was published by Walsworth Publishing Company in 2005. This book is the expanded third edition and is available in hardcover. 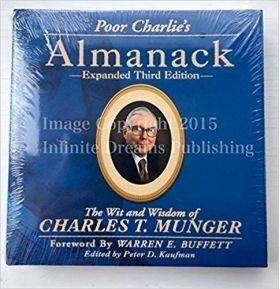 Poor Charlie's Almanack: The Wit and Wisdom of Charles T. Munger has photographs and graphics. It also has sidebars that provide additional information and explains certain concepts.